The main Wall Street indexes finished at fresh record highs on the back of increased confidence that President Trump's tax cut plan will progress. 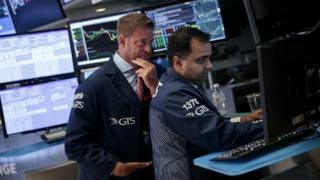 The Dow Jones rose 165.59 points to 23,328.63, while the Nasdaq index was 23.99 points higher at 6,629.05. The wider S&P 500 index posted its sixth week of gains, climbing 13.11 points to 2,575.21. On Thursday the Senate passed a budget blueprint, a move that is being seen as raising the likelihood of tax cuts. Shares of General Electric reversed steep early losses to finish 1.1% higher. The industrial giant reported a 5% fall in third quarter earnings to $1.8bn, which was worse than expected, but new chief executive John Flannery promised to do what it takes to turn around the firm. The firm also slashed its forecast for full-year operating profits to between $1.05 and $1.10 a share, compared with the estimate of $1.60-$1.70 a share it made in July. However, bank stocks rose after the Senate approved the budget resolution for the 2018 fiscal year. Shares in JP Morgan Chase rose 1% and Goldman Sachs was 2% higher.